Thank the exceptional people whose contributions of time, talent and treasure make possible our mission of empowering girls to gain STEAM – science, tech, engineering, art + design, and math. Give donors an opportunity to see mission impact first hand. Maria Passantino sent a video postcard from Rochester Institute of Technology, where she is studying animation. While in high school, Maria participated in multiple service learning programs through Pretty Brainy, the experience of which she credits for helping her win full scholarships to multiple schools. Rochester Institute of Technology was her final choice. Girls from Pretty Brainy’s program leadership team unveiled their STEAM service learning project for 2018. Lauren Isenhour, a physics major at Colorado State University, and M.J., a high school junior, introduced MISSion Innovation: Girls Innovate Real-Life Situations. The event will be a 24-hour innovation marathon that will give high school and college students experience to learn or deepen their knowledge of code, innovation, and design thinking. Teams participating in the event will innovate in support of sustainable cities and communities. The program is targeted for February 2018 at Colorado State University. Registration opens in December. 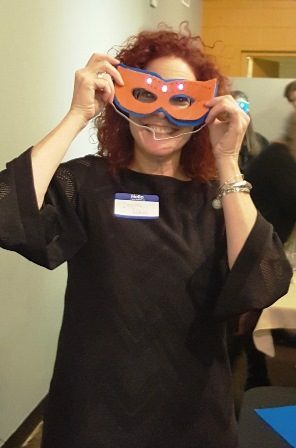 Dawn Putney, ToolBox Creative, with her finished mask. Girls in STEAM learning with Pretty Brainy taught guests the project, a blend of the science of electricity with art and design. This year, 2017, marks the first that Pretty Brainy has extended Ada Lovelace Day beyond girls’ STEAM workshops and into the Northern Colorado community. Learn more about the Pretty Brainy mission of empowering girls to gain STEAM. Ada Lovelace Day, marked each year in October, was founded in 2009 by Suw Charman-Anderson. The celebration features a flagship Ada Lovelace Day Live! science cabaret in London, at which women in STEM give short talks about their work or about women who have inspired them. The global celebration includes independently organized grassroots events such as Pretty Brainy presented. Learn about Ada Lovelace and how she wrote the first computer program – 100 years before a computer was built. Visit www.findingada.com.